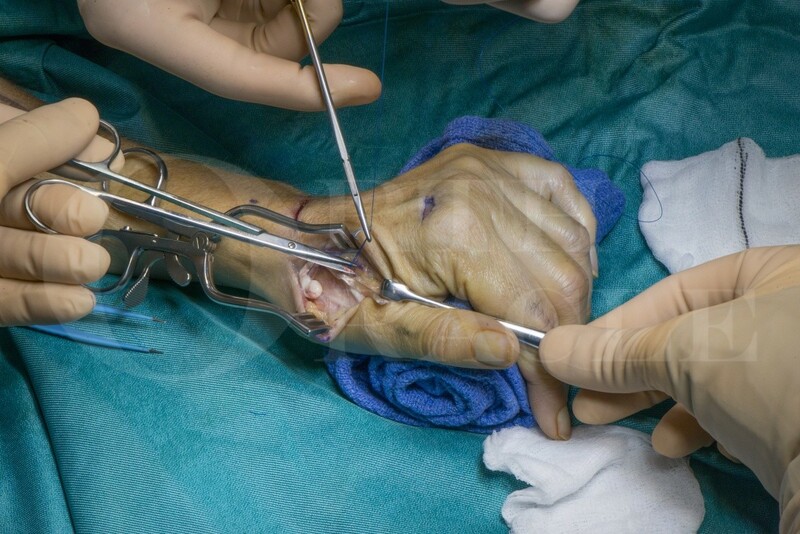 Learn the EIP to EPL Tendon Transfer surgical technique with step by step instructions on OrthOracle. Our e-learning platform contains high resolution images and a certified CME of the EIP to EPL Tendon Transfer surgical procedure. The extensor pollicis longus (EPL) tendon extends the thumb interphalangeal joint and also contributes to metacarpophalangeal joint extension. It serves an important role in hand opening and fine control of thumb position. Although an acute injury resulting in division of the tendon will merit direct repair, many other causes of EPL dysfunction may be treated by tendon transfer. The commonest indication for EIP to EPL transfer is following attrition rupture of the EPL in the 3rd extensor compartment of the wrist associated with a distal radius fracture. The commonest and certainly the simplest donor tendon to transfer to EPL is the extensor indicis proprius tendon in such cases.